Individual Resinator Stations connect to the rinse stations of each process cell to deionize and recycle the individual rinses. The Resinator deionizes virtually all ion-containing rinsewaters, including cyanide-based, electroless, and chromate solutions. Segregating the applications prevents cross-contamination of rinse systems by nonionic organics present in many process chemistries. The modular design allows upgrades to be applied to individual process systems as production demand increases. Selective application to the most troublesome process solutions can alleviate wastewater treatment system overloads. The Resinator system consists of two components. The first is the Resinator pumping station itself, which includes resin columns, centrifugal pump, particulate and carbon filters, flowmeter, conductivity cell and alarm. All components are assembled on an epoxy coated steel base with only electrical connection to the control panel and plumbing to the rinse tank required for installation. There are two sets of columns at each Resinator pump station, which allows one set to be on line while the other is being regenerated. Each column is capable of removing 2 to 2.5 lbs of metal or the equivalent amount of ionic salts. The pumping stations are configured with two, four, or six IX columns depending on the specific application. 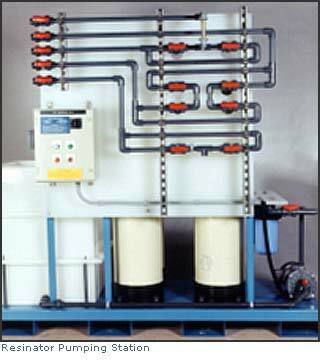 The Resinator is a point-of-source recycling system for purifying rinsewaters on-line. The Resinator removes metals and salts returning up to 6 gpm of deionized water back to the rinse tank. Circulating DI water between the rinse tank and the Resinator provides an effective rinse flow rate with no flow to the treatment system. Lowering the flow of effluent to the treatment system can reduce the hydraulic loading allowing more effective treatment. The Resinator may be used to segregate a particular metal or process solution from the main treatment system. The installation of special chelating resin allows the Resinator to be used for polishing the final effluent. The Resinator pumping stations may be hard plumbed or connected by flexiblebe connectors with quick disconnects to the Regeneration station, the second component of the Resinator system. The Regeneration station includes programmable-controlled solenoid valves, metering pumps, flowmeters, and sampling ports. The use of metering pumps for the feed of regenerant acid or caustic eliminates the requirement for pre-mixing. Metering pumps also assure more accurate dispensing of regenerant reagents than eductor systems. The regeneration process uses dilute acid and caustic to reactivate the exhausted resins. Regenerate by-products are segregated by process and may be electrowinned for metal recovery, treated for reuse or disposal, or evaporated to a small volume of concentrate and shipped to an outside recovery center. 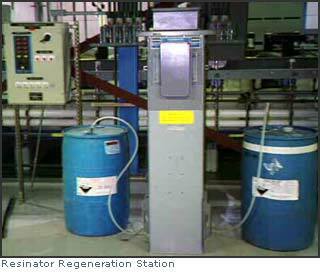 One Regeneration station serves several Resinator stations, thereby providing centralized control over the regeneration process and products.